As a Swift volunteer you are a representative of Swift Youth Foundation. Thank you for taking the time out of your day to add value to the lives of over 300 Swift youth by playing great games and eating amazing food. We are excited that you will be joining us. Are the participants having fun? Are you being a good role model? If you make sure you can always answer yes to these three questions, you’re doing great! School appropriate and comfortable clothing and shoes that you can run around in (you'll be doing A LOT of walking). The event is outside so please take this into consideration when dressing for the day. Sunscreen will be provided at the event, but please take proper sun safety precautions before arriving (hat, sunglasses, etc). Upon arriving you will be provided with a special volunteer T-shirt and expected to wear it all day. There are bathrooms onsite where you can change. Bring a reusable water bottle or hydroflask. There will be hydration stations throughout the event. Participants and volunteers are encouraged to stay hydrated while at the Swift Carnival. Again, the event is outside and for the safety of all, please stay hydrated! Swift Carnival is a "Phone Free" Event. Please plan to leave cell phones in your bags and away from participants. We want you to be present in the moment in order to provide the participants with the best experience possible (and for yourselves). We will have a professional photographer at the carnival so there will be tons of photos of you and your kids that we’ll be posting after the carnival at SwiftYouth.org/Carnival2019. Where Do I Need to Go and When Do I need To Be There? Address: 15801 N 29th St, Phoenix, AZ 85032 Please note, for our returning volunteers this IS NOT the location of previous Swift Carnivals. 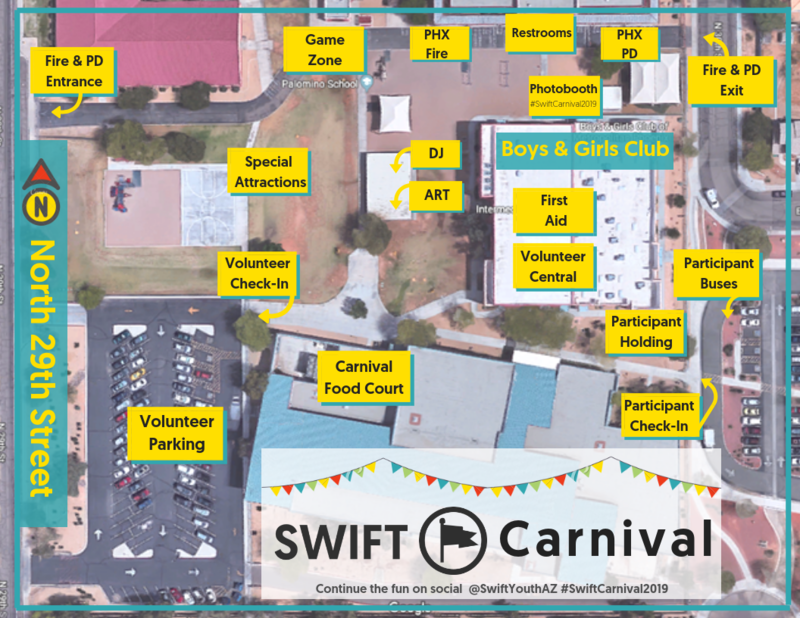 Parking: Swift Carnival 2019 will be located at Palomino and you will be checking into the event and parking in the teacher parking lot off of North 29th Street (West of the Boys and Girl's Club where we have Swift Saturdays). There will be a parking attendant helping to direct traffic in this lot, all spaces are first come, first served. Carpooling is highly encouraged! Time: Volunteer check-in begins at 10:30am and all volunteers are asked to arrive no later than 11:00am for check-in, orientation and training, and to assist in final event set up. Please be on time. Great question! The show will go on... aka Swift Carnival 2019 will still go on even if it rains. Please plan accordingly. You will receive notification leading up to the event that will include weather considerations. Yes! Swift started with a simple idea, "give them all the food they can eat and all the love they can take!" Keeping in this tradition, we love to meet the basic needs of our participants and volunteers, so y-e-s! you'll be well fed! Break Area - volunteer central, located in the Boys and Girl's Club on the East side of the event, will have plenty of snacks for you! Does this count for service hours? Yes! If you would like to count Swift Carnival 2019 for volunteer service hours, please pick up a letter at the end of the Carnival from volunteer check-out. This letter will certify that you volunteered for four hours of community service. If you have any special forms to be filled out or need another type of verification of your service, please email us at Mike@SwiftYouth.org. Email us! Or on day of the Carnival, all of our staff and lead volunteers will be wearing yellow t-shirts. Feel free to reach out to any of the Swift team in yellow shirts, they'll be happy to help! What's the Hashtag for the day? ​​What are my volunteer options? You will select one of two volunteer options when you arrive to volunteer check-in, booth leader or group leader. Please read the volunteer descriptions below to help you decide which is a best fit for you! There will be a write up of the games instructions and how to play for you to review when you get to your booth. Make sure that you are interacting with the participants and are speaking to them on their level. We may ask you to assist with lunch as well prior to the start of the carnival activities. Be there to make the kids’ day AMAZING! When you first meet your group, play an icebreaker game and ask them questions. Let the participants decide which booths they want to go to. Never be alone with a participant (this is especially important when making bathroom trips)! What happens if I, or my participant have an accident? Ouch! If you or a youth participant have an accident, please seek assistance in the first aid station located in the Boys and Girl's Club located on the East side of the event. Can I bring a friend to volunteer with me?